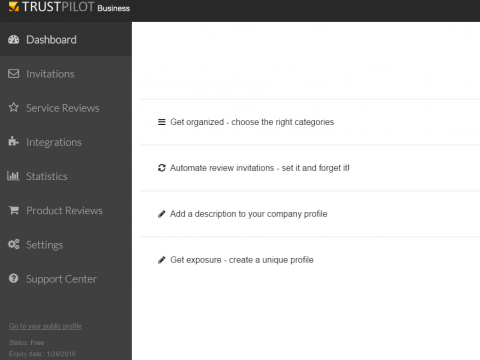 "Turn your customer reviews into a success, completely automated." Customers love to be convinced by other customers, especially when it comes to webshop-reviews. 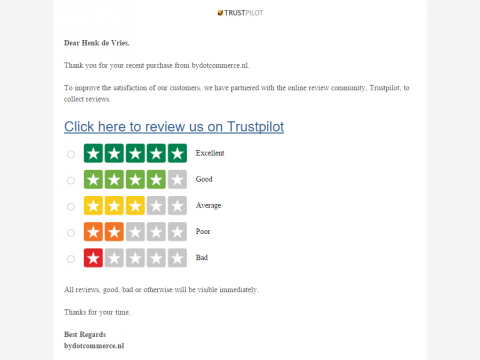 Trustpilot receives more than 500,00 customer reviews a month for webshops world-wide. With the Trustpilot-application made by DotCommerce you'll invite your clientele to write a review of your webshop and rate it (rating between one and five stars). Reviews will not only increase conversion, but they will also raise a feeling of trust. After installting the application you'll have direct access to DotCommerce's backoffice. De Trustpilot-application will be your personal assistant when it comes to customer reviews, once you've connected the application to your webshop the application will take care of the rest. The preferred language and the frequency of messages can be configured in the appframework of DotCommerce. Productreviews are not yet supported. Expected to launch at Q1 2016. 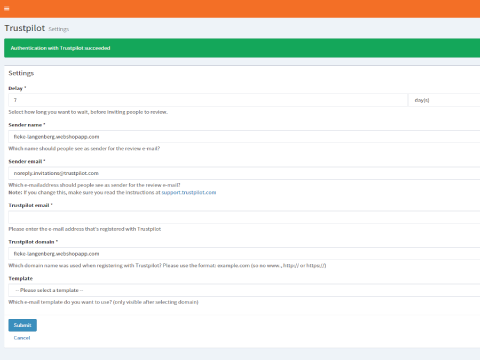 Import note: This app connects TrustPilot to SEOshop. You also need a TrustPilot acocunt.